This article discusses a regular Populi login. Some schools, however, use different systems to create usernames and passwords that they then use with Populi. Such systems don't work the same way Populi logins work. If you're at such a school, no doubt they've made that known. If you have questions about such a login, please check with a staff member at your school. To use Populi, you need a login. Your login consists of a username and password—and, for users who are required to use login approvals, an additional one-time use passcode. To get a login, an existing Populi user has to set it up for you. 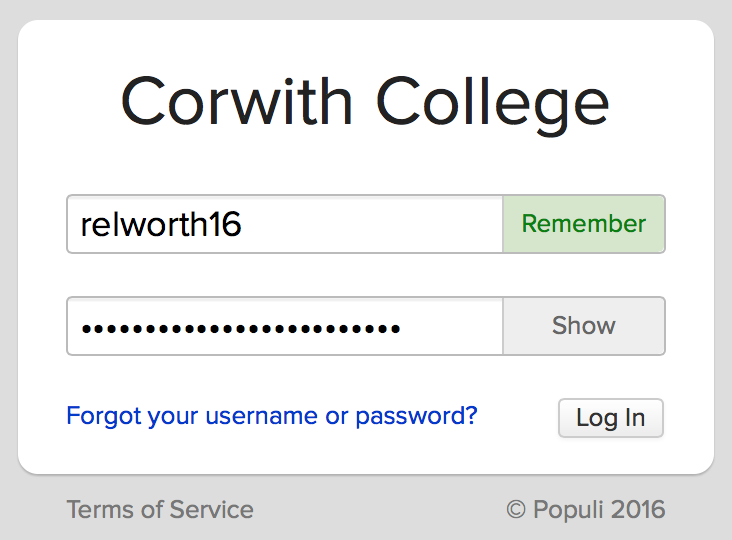 Here are all the ins-and-outs of your Populi account login. Here's how to change your password from your profile. Need to reset your password? Here's how to do that. Login approval is a security measure that helps protect your Populi user account by requiring an extra login "factor"—in this case, a passcode sent to your mobile phone. Your school may either allow or require you to use login approvals. To use login approvals, you must have a verified text notification number. Recognized devices are created whenever you log in to Populi on a new browser or device (a computer, phone, or tablet). You can find a list of recognized devices in your personal settings. If login approvals are required for your account, you'll have to enter a passcode every time you log in on a device that's not on that list. After a device is recognized for your account, you can also mark devices trusted, which means that you can remain logged in on that device for as long as you wish. You can read more about login approvals and recognized devices in personal settings. When someone creates a new user account for you, you'll be sent a welcome email from your school via notifications@populi.co. The email contains your username, which was set up for you by your school. It also contains a unique link that lets you set a password and log in to Populi for the first time. This link will expire seven days from when the email is sent. Even if you don't need to use Populi right away, we recommend logging in as soon as you see the email just so it doesn't expire on you! The first thing you'll be asked for on the login page is a mobile phone number. After entering your number, Populi will text you a verification code. Enter the code to verify your number and you'll be taken to the password screen. If login approvals are required for your user account, you must enter a mobile phone number to proceed. If login approvals are merely allowed for your account, you'll have the option to skip this step. Your password needs to be at least 10 characters long, contain at least one capital letter, and at least one number. You can also use special characters and spaces. When all the instructions are green, your password is good to go. Afterwards, confirm your password by typing it again. Check to indicate your acceptance of the Acceptable Use Policy. When you're done, click Save Password and Log In. You'll be taken to your Populi Home page. Go to your school's unique Populi URL. It looks something like this: https://yourschool.populiweb.com. You can find this URL by looking at your welcome email. You can also bookmark your school's Populi login page. Enter your username. If you're using your own computer, click Remember to have Populi remember your username whenever you log in—less typing! If you're using a public computer, don't click Remember! Enter your password. This field hides what you're typing by showing your characters as black dots. If need be, click Show so you can see what you're typing—but we recommend you don't do this if you're in a public place. If login approvals are required for your account and you're logging in on a new device or web browser, Populi will send a one-time passcode to your mobile phone so you can complete this login. Click Log in or press Enter on your keyboard. Once logged in, if you leave your account open without using it, Populi will automatically log you out after one hour (unless you're using one of your trusted devices). This is to help prevent unauthorized access to your account. If you get logged out, you can log right back in. Populi will take you right back to where you were working. You can open multiple Populi browser tabs. As long as you're doing something in one of those tabs (moving your mouse, typing something, etc. ), the timeout clock will reset itself. Your Populi login also admits you to this help system. Just go to https://support.populiweb.com and enter your regular username and password, and then enter your school's unique Populi subdomain. If you're already logged in to Populi, just click the Help link in the upper left.